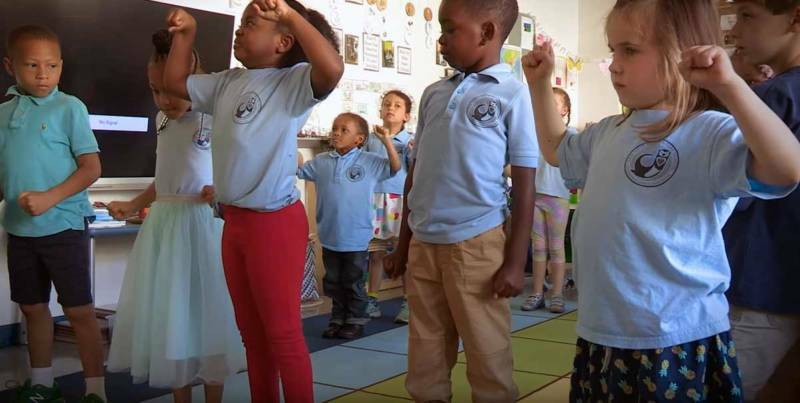 For many kids, sitting still all day in school is a big challenge, which is why movement breaks are good practice, whether it's in elementary school or high school. Additionally, learning science shows us that movement activates the brain and improves cognition. "This idea of children sitting for long periods of time, they aren’t naturally wired to do that," said Dr. Pamela Cantor, Founder and Chief Science Advisor of Turnaround for Children in an Edutopia video series on the science of learning. "So rather than put them in a position where they have to act out to demonstrate that they need to be able to move, building in movement breaks means that they will get some of the stress relief, some of the energy release that they need in order to be able to get calm again and pay attention to learning." And for students who come to school having experienced some form of trauma, movement is even more important. "If we do have a certain percentage of kids with toxic stress, they have high amounts of cortisol and the way to release that is through physical movement," said Cynthia Robinson-Rivers, head of school at Van Ness Elementary school in Washington, D.C. Giving students a chance to exercise and move during the day will help them self-regulate during class time, but it can be difficult for kids to transition from high energy spaces to calmer spaces. Incorporating a simple mindfulness practice after lunch or at the start of the school day can help students calm down and prepare themselves to learn again. "I never require kids to close their eyes, because that can feel really unsettling," said second grade teacher Lindsey Minder. "We talk about looking into the palms of their hands or they're looking into the seam on their sneakers, whatever works for them." She's aware that mindfulness doesn't have to look a certain way to be effective. Its main purpose is to help students transition, calm down, and get to know their own needs. "The impact of the mindfulness practice is really this general sense of them being more comfortable and confident with themselves and their varying needs and decreases in anxiety around academic work," she said. Students understand its purpose without much trouble. "We do mindfulness because during lunch, it gets a little crazy," said second grader Ayne. "And so, when we go upstairs, we calm down so we can transfer to writing."